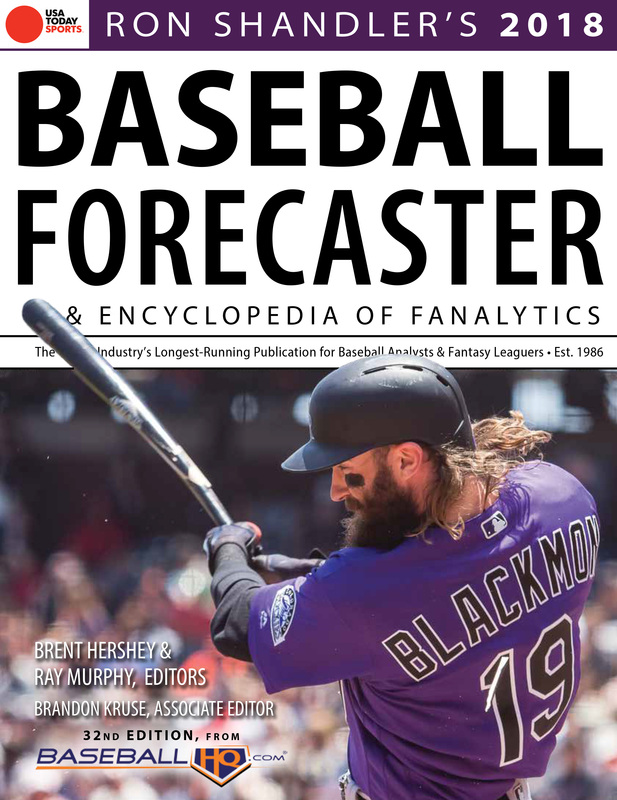 Dr. D got his Ron Shandler BaseballHQ Forecaster in the post. This is going to heat up a cold news month by more than a degree or two. You can get your own copy at this site. If you spend money on only a few baseball things each year, this is one a' them. (2) And focus strongly on what the YEAR-TO-YEAR TRENDS ARE for these players. In other words, it's one thing to note that Mike Leake's xFIP is different than it used to be. It's a completely different thing to --- > over-arc a player's batting EYE over his age 24-27 seasons and note that it is typical of an impending breakout. HQ allows you to spring-dive into your own analysis. Perfect red meat for the salivating SSI Denizen. 2) Healy's CONTACT RATE went way up in the second half of 2017, as his power "collapsed" (to a weirdly low 65 PX). Shandler regards it as quite obvious that Healy's batting approach was to stop swinging for the fences and to "fix" a perceived batting average problem, even though there was no such AVG problem. Healy was hitting .276 in the first half. 3) Dr. D jumping in to interrupt here, inserting an HQ axiom: Healy is learning on the job, is 26-with-experience player, and "once you possess a skill you own it." 4) Simply doing no more than "recapturing" his 2017 first half would lead to: "UP: 35 HR." Which would make Healy a bankable MOTO hitter. That's the upside, but it's an upside that Healy just did over the calendar year July 2016-June 2017, and Shandler's got a lucrative $19 bid logged on Healy. Those other three March 1B's are beginning to fade a bit, neh? We have used the facile paradigm that Healy is a LHP-basher, whereas Shandler correctly redirects us to the 26-with-experience paradigm. Oakland GM David Forst's words resonate here; it's the kind of thing you hear only once in a while from GM's and it's when they know they are trading production for production. That's what you say when you deal Mitch Haniger and extras for Chris Archer. Tampa's getting a very good right fielder; you get it? If he contends for an MVP don't call us stupid. We knew. Jerry Dipoto likes "post-hype sleepers," especially those who have shown production at AAA or higher. Zduriencik was into drafting; Dipoto is into post-22 hitters who have sabermetric slash lines, like Gamel and Haniger. It's another philosophy of his you've got to be glad about. It won't take many more Mitch Haniger heists to justify De Poet's confidence and approach, will it? At any rate, Dr. D doubts that he must explain to the Denizens what happens if --- > Ryon Healy pops 19 homers in each half this year. From the 9 hole, presumably. Seeing Healy as a Tino like regret that the A's would have to see for 20-ish games each year for the next 5 would be nice. Eh, couldn't it have been a different division rival? I'm really starting to feel sorry for Oakland. If he's just around 25-30 it's like cloning Seager and putting the clone at 1b. The copy lost much defensive ability and seems to have no idea how to draw a walk, but otherwise. One post to the right I mentioned him as one of the guys that has rise potential but I hadn't put together 30+ HR chances. Don't think it happens if he's still fishing to a sub-5 BB%. Maybe Edgar...Trumbo's first full season was barely sub-5. It's 6.8 vs 3.9 career so far, not to say Trumbo is not the right comparison. I just have a hard time thinking of sub-5 BB% MOTO. Vlad was career 8.1% that cleared 10 in 4 different years. Is Shandler basing their "fix the BA" assumption on some comment by Healy? It would be just as easy to conclude that pitchers decided that 32 homers n a full season equivalent wre morethan enough proof that they were attacking Healy badly, and it was the pitchers who adjusted. Not to take anything away from our guy. I love his relaxed/natural stance and the way he creams misses. BUt minus some point made by Healy, I think they may be jumping to a conclusion that may well have other explanations. Don't miss who's listed in his neighborhood under, "top power/contact under 70%"